The Brusilov Offensive (Russian: Брусиловский прорыв Brusilovskiĭ proryv, literally: "Brusilov's breakthrough"), also known as the "June Advance", of June to September 1916 was the Russian Empire's greatest feat of arms during World War I, and among the most lethal offensives in world history. Historian Graydon Tunstall called the Brusilov Offensive the worst crisis of World War I for Austria-Hungary and the Triple Entente's greatest victory, but it came at a tremendous loss of life. The offensive involved a major Russian attack against the armies of the Central Powers on the Eastern Front. Launched on 4 June 1916, it lasted until late September. It took place in an area of present-day western Ukraine, in the general vicinity of the towns of Lviv, Kovel, and Lutsk. The offensive takes its name after the commander in charge of the Southwestern Front of the Imperial Russian Army, General Aleksei Brusilov. Under the terms of their Chantilly Agreement of December 1915, Russia, France, Britain and Italy committed to simultaneous attacks against the Central Powers in the summer of 1916. Russia felt obliged to lend troops to fight in France and Salonika (against her own wishes), and to attack on the Eastern Front, in the hope of obtaining munitions from Britain and France. In March 1916 the Russians initiated the disastrous Lake Naroch Offensive in the Vilno area, during which the Germans suffered only one-fifth as many casualties as the Russians. This offensive took place at French request - General Joseph Joffre had hoped that the Germans would transfer more units to the East after the Battle of Verdun began in February 1916. General Aleksei Brusilov presented[when?] a plan to the Stavka (the Russian high command), proposing a massive offensive by his Southwestern Front against the Austro-Hungarian forces in Galicia. Brusilov's plan aimed to take some of the pressure off French and British armies in France and the Italian Army along the Isonzo Front and, if possible, to knock Austria-Hungary out of the war. As the Austrian army was heavily engaged in Italy, the Russian army enjoyed a significant numerical advantage in the Galician sector. Gen. Alexei Evert, commander of the Russian Western Army Group, favored a defensive strategy and was opposed to Brusilov's offensive. Tsar Nicholas II had taken personal command of the army in September 1915. Evert was a strong supporter of Nicholas and the Romanovs, but the Tsar approved Brusilov's plan. The objectives were to be the cities of Kovel and Lviv, which had been recovered by the Central Powers the previous year. Although Stavka had approved Brusilov's plan, his request for supporting offensives by neighboring fronts was denied. On 4 June 1916, the Russians opened the offensive with a massive, accurate but brief artillery barrage against the Austro-Hungarian lines, with the key factor of this effective bombardment being its brevity and accuracy. This was in contrast to the usual, protracted barrages at the time that gave the defenders time to bring up reserves and evacuate forward trenches while damaging the battlefield so badly that it was hard for attackers to advance. The initial attack was successful, and the Austro-Hungarian lines were broken, enabling three of Brusilov's four armies to advance on a wide front (see: Battle of Kostiuchnówka). On 8 June forces of the Southwestern Front took Lutsk. The Austrian commander, Archduke Josef Ferdinand, barely escaped the city before the Russians entered, a testament to the speed of the Russian advance. By now the Austrians were in full retreat and the Russians had taken over 200,000 prisoners. 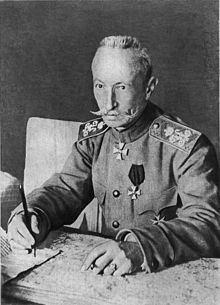 Brusilov's forces were becoming overextended and he made it clear that further success of the operation depended on Evert launching his part of the offensive. Evert, however, continued to delay, which gave the German high command time to send reinforcements to the Eastern Front. In a meeting held on the same day Lutsk fell, German Chief of Staff Erich von Falkenhayn persuaded his Austrian counterpart Franz Conrad von Hötzendorf to pull troops away from the Italian Front to counter the Russians in Galicia. Field Marshal Paul von Hindenburg, Germany's commander in the East (Oberkommando-Ost), was again able to capitalize on good railroads to bring German reinforcements to the front. Finally, on 18 June a weak and poorly prepared offensive commenced under Evert. On 24 July Alexander von Linsingen counterattacked the Russians south of Kovel and temporarily checked them. On 28 July Brusilov resumed his own offensive, and although his armies were short on supplies he reached the Carpathian Mountains by 20 September. The Russian high command started transferring troops from Evert's front to reinforce Brusilov, a transfer Brusilov strongly opposed because more troops only served to clutter his front. On 18 June 1916, an article entitled "Hero of the Hour in Russia, Described Intimately by One Who Knows Him Well" by Brusilov's brother-in-law, Charles Johnson, appeared in The New York Times. Brusilov's operation achieved its original goal of forcing Germany to halt its attack on Verdun and transfer considerable forces to the East. It also broke the back of the Austro-Hungarian Army, which suffered the majority of the casualties. Afterward, the Austro-Hungarian army increasingly had to rely on the support of the German army for its military successes. On the other hand, the German army did not suffer much from the operation and retained most of its offensive power afterward. The early success of the offensive convinced Romania to enter the war on the side of the Entente, though that turned out to be a bad decision since it led to the failure of the 1916 campaign. Russian casualties were considerable, numbering between 500,000 and 1,000,000.Austria-Hungary and Germany lost 616,000 and 148,000, respectively, making a total of 764,000 casualties. The Brusilov Offensive is considered as one of the most lethal offensives in world history. The Brusilov Offensive was the high point of the Russian effort during World War I, and was a manifestation of good leadership and planning on the part of the Imperial Russian Army coupled with great skill of the lower ranks. According to John Keegan, "the Brusilov Offensive was, on the scale by which success was measured in the foot-by-foot fighting of the First World War, the greatest victory seen on any front since the trench lines had been dug on the Aisne two years before". The operation was marked by a considerable improvement in the quality of Russian tactics. Brusilov used smaller, specialized units to attack weak points in the Austro-Hungarian trench lines and blow open holes for the rest of the army to advance into. These were a remarkable departure from the human wave attacks that had dominated the strategy of all the major armies until that point during World War I. Evert used conventional tactics that were to prove costly and indecisive, thereby costing Russia its chance for a victory in 1916. The irony was that other Russian commanders did not realize the potential of the tactics that Brusilov had devised. Similar tactics were proposed separately by French, Germans, and British on the Western Front, and employed at the Battle of Verdun earlier in the year, and would henceforth be used to an even greater degree by the Germans, who utilized stormtroopers and infiltration tactics to great effect in the 1918 Spring Offensive. Breakthrough tactics were later to play a large role in the early German blitzkrieg offensives of World War II and the later attacks by the Soviet Union and the Western Allies to defeat Germany, and evolved into modern armoured warfare. ^ Turkey In The First World War: Galicia. Turkish losses for September were: unknown on the action of September 2. 7,000 on the actions of September 16/17. 5,000 on the actions of September 30. Keegan, John (2000). The First World War. Toronto: Vintage Canada. ISBN 0-676-97224-1. Stone, Norman (1998) . The Eastern Front 1914–1917. London: Penguin Books. ISBN 0-14-026725-5. Washburn, Stanley (1917). The Russian offensive, being the third volume of "Field notes from the Russian front," embracing the period from June 5th to Sept. 1st, 1916. London: Constable. Sergei Sergeyev-Tsensky, . Brusilov's Break-Through: A Novel of the First World War, translated into English by Helen Altschuler, Hutchinson & Co, London, 1945. Wikimedia Commons has media related to Brusilov Offensive. This page was last edited on 13 April 2019, at 00:44 (UTC).